Some days he cracks me up. Other days he can be a real bummer. If you’re just now tuning in or are lucky enough to afford a rock to live under, Housing Minister Phil Twyford is in charge of an ambitious programme to build 100,000 homes in New Zealand in 10 years. The theory is that the government can encourage building by alleviating some of the risks taken on by construction companies…and by contracting lots of new builds on the taxpayer’s dime. Eventually, additional supply should bring prices down and improve affordability. That’s the idea anyways. According to his targets, Twyford plans on cranking out 12,000 homes a year by 2021…and to get there, he’s set some tiered goals. From 2020-2021, he’s aiming at 10,000 homes. From 2019-2020, he’s aiming at 5,000 homes. And from 2018 to this July, he’s promised 1,000 homes. Seems reasonable, right? 1,000 houses? Especially when he thinks he’ll be doing 12,000 per year soon? Well…here’s the bummer. Since the programme began about six months ago, there have been 33 houses built. And only 77 are under construction now. Ol’ Phil’s going to be lucky to hit triple digits by his first deadline…and he knows it. Good on you, Phil, for not giving up. I’ll give you that. But what I can’t give you are the roughly 900 houses that you’re going to be short come July. At least there’s not a long waiting list of disappointed KiwiBuild applicants. According to Stuff, there are only 47 confirmed homeowners in the scheme…and 267 prospective buyers that have been ‘pre-qualified’ according to the requirements. But let’s not beat a dead horse. We’ve expected this result. It’s how government schemes typically go, isn’t it? Today, let’s take a look at the flip side of the government coin — gold. If I asked you what gold is used for, you’d probably say jewellery, right? Well, you’d be half right. Gold has lots of other uses, from dentistry to electronics to official coinage. 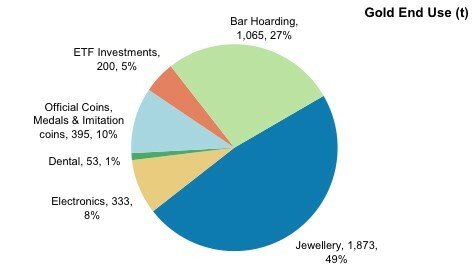 But over a quarter of all gold is hoarded as straight bullion. And by the way, in a 2011 study, researchers found that 79% of gold was consumed by Asians. ‘To remove some of your wealth from the banking system — Gold is the only financial asset that has no counter-party risk. Physical gold in your possession has no debt obligation, so there is not someone else on the other side of the trade whom you rely upon to remain solvent. ‘Protection from devaluation — Paper currencies have steadily been losing value over the past century. Precious metals “store of wealth” characteristics offer protection against government devaluation of currencies. Be they of the slow and steady kind by inflation of the money supply or overnight devaluations by government decree. ‘To become your own central bank — In case you didn’t know the Reserve Bank of New Zealand has no gold reserves, so don’t expect any help from them in terms of maintaining the purchasing power of the NZ dollar. Buy gold and become your own central bank instead. ‘Protect your purchasing power with history’s best ever store of wealth — An often-quoted point is that a fine toga and sandals in roman times cost an ounce of gold. Today an ounce of gold still buys a fine suit and pair of shoes. But, the same cannot be said with any fiat or paper currency of only 100 years ago. $20 may have bought a suit in the early 20th century. It doesn’t buy much more than a couple pairs of socks a century later. ‘Every fiat (government decreed) currency has eventually gone to zero throughout history — Today we are in the unique situation where every currency on the planet is a totally unbacked fiat currency. And history has shown that no fiat currency lasts forever. So, buy gold as it can’t go to zero and will always be worth something, if a few thousand years of history is any indication. Do you see the common (golden) thread? Gold does what centralised currency cannot — provide you with autonomous control over your wealth. And more importantly, it can insulate you from geopolitical risks, market risks, central bankers, negative interest rates and more. It’s basically an all-around handy investment to protect yourself. Look at it this way — stocks can help grow your wealth, while gold can preserve it. Diversifying into both gold and shares is a fantastic way to responsibly manage your wealth. And as you lose confidence in the markets, consider shifting towards more gold. As your confidence returns, shift back to stocks. Unfortunately, not many wealth managers recommend actual gold. It’s simply not a great way for them to collect fees, nor is it going to make any impressive returns. If anything, they’d try to push for a gold ETF or something related. So, that means you’re probably on your own to buy some yourself. If you’re interested, or just want to know more about what gold can offer, you can check out this free eCourse by the guys at Gold Survival Guide. And if you are already a goldbug, I’d like to hear your story. What led you to buy some? How have you benefited? If you could give advice to someone just starting off, what would it be?